Giving students "voice, choice and connectivity" will help them gain a sense of belonging in a group even when they're states and countries apart. Sure, you use your learning management system's discussion forums to bring people together online for class conversations. Yet, that's not the same as creating community. According to Bonnie Mullinix, a lead member of the contributing faculty in the PhD program at Walden University's College of Education, discussion forum activity is often done "pro forma" — as a requirement of class. True community encompasses student "voice, choice and connectivity," she asserted, during a presentation she delivered at the recent Online Learning Consortium Innovate 2017 conference. Best, she said, the tools that can help build community in online courses are free. Mullinix began her hunt for community-friendly tools in 2015 as she began leading a research forum of people doing their dissertations. Like most online students, she said, they needed to be able "to work on their own stuff [but] still feel like they're not completely alone." Without a sense of community, they weren't learning "from each other's mistakes and discoveries in the ways that we hoped they would." What was needed, she suggested, was a "synchronous online meeting" — bringing everybody together at the same time. Simple enough on the surface. Except, as with most online classrooms, this one had people in numerous time zones. So the first community-building exercise was to figure out "where and when to meet" — the connectivity part of Mullinix's community equation. With each subsequent step in the process, the group developed a model for handling shared facilitation and development of topics and focus — the voice and choice parts. Here are the lessons she learned and the tools that worked. 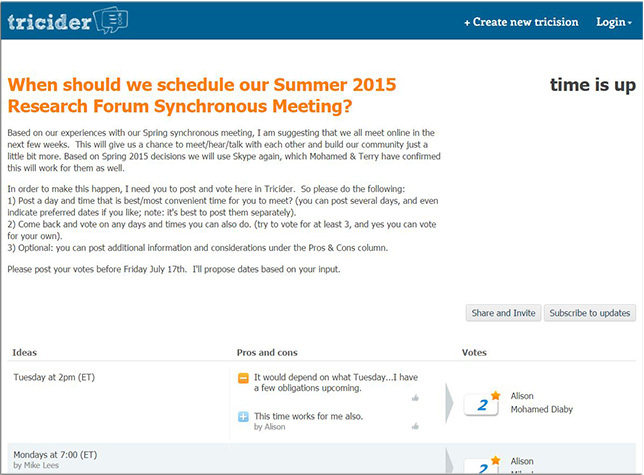 Tricider turns scheduling into a group activity. An initial meeting was scheduled by Mullinix and run through Skype, which worked well enough for a first gathering. But to strengthen the community "just a little more," she wanted the participants to sort out scheduling as a group activity. For that, she started with tricider, a service that allows somebody to ask a question and invite others to submit their ideas and vote for their favorites. In this case, the question she posed was straightforward: "When should we schedule our Summer 2015 Research Forum Synchronous Meeting?" Her students were asked to post days and times that were best for them to meet and then to return to the site to specify which of the choices among all of them were their top three picks. All the votes from that step were plugged into a Doodle poll, to expose where the choices converged. By allowing participants to see everybody's results and understand how the group progressed to its decision, "it [created] understanding across the board," said Mullinix. A Doodle poll makes results transparent to the entire group. Although Skype was where the meetings started, it wasn't where they ended. "It's great. It works fine. It gives me the screen sharing that I want in addition to people's voices," said Mullinix. But, she added, it also has its complexities: "I have to know their Skype ID. They have to accept me or I have to accept them as a connection. Then I have to build a group and I have to place the call." Other choices included Google Hangouts, but that turned out to have a "bit of a learning curve." Zoom, the latest preference, has the same features as Skype with one advantage: It's simpler to enter a virtual gathering. No pre-installation needed, no sign-up required. "You send a link out to people, they click on it and they're in," she explained. Also, no matter when the virtual sessions took place, inevitably some participants couldn't make it. Attendance was deemed optional. Zoom allowed Mullinix to record the session and post it as an on-demand session that people could view when they had the time. It may be that everybody is moving in lockstep through the material in your course, in which case sorting out the topics to cover during a given session will be more apparent. That wasn't the situation for Mullinix's research forum, in which each member was at a different stage in his or her dissertation work. Nor will it be the scenario if your class follows a personalized or competency-based learning approach. In most cases, some participants will be further along than others. Her approach early on was to have the group "talk across the entire experience" within the program to enable participants to "see where they fit and where others were." That discussion helped them feel like part of the community. It also helped them get a sense of where they might be able to take the lead for a given discussion, which they would then facilitate during an online gathering. To accommodate community members' need to stay connected outside of the synchronous sessions, Mullinix introduced her students to a couple of tools. Appear.in lets the user create a room link, share the link with others and allow them to come in for conversation on the fly. TodaysMeet, an education tool, acts like an enclosed version of Twitter. "You don't sign up. You go to a website. You punch in the name of what you want your room to be and immediately it's running," said Mullinix. Her forum class has also used TodaysMeet for feedback and back channel conversation during virtual sessions. When the expiration set by the original user comes up days or weeks later, the contents vanish. Most educators are familiar with Google Forms, SurveyMonkey and Poll Everywhere for gathering information. What's less well known: Padlet and Socrative. Padlet is an online service that lets people share content. Mullinix described it as a wall space "where you can put sticky notes with whatever it is you're talking about." For example, if somebody posts a question on a given topic, other users can post their responses, which can be moved around, and the results can be viewed as a group for further discussion or for work outside of the virtual meeting. Padlet lets people share content on an online wall. Socrative provides quick questioning, quizzing and surveying. Reporting can be downloaded to Google Drive for later analysis. For example, the community might develop a feedback survey in the program to post after each virtual session to continue helping the group improve its processes. Most institutions these days already have a shared area, whether it's Google G Suite, Microsoft OneDrive, Dropbox, an institutional intranet or an LMS, where students can share documents they're working on. The use of those "is really important," said Mullinix. "I don't mean just to submit [papers] for grading. I mean a common space, and preferably somewhere they can collaborate and build on each other's work. That can be a powerful tool." For example, when Walden developed a new doctoral capstone resources website, forum group members headed out on a virtual scavenger hunt, shared the tools and resources they found most useful and explained why within a Google document. On top of those, however, Mullinix recommends three additional online programs: Nearpod, already popular among K-12 teachers, lets users click on a link and bring up on their own devices whatever the person presenting wants to display. As Mullinix pointed out, with Nearpod, "you could log in from anywhere and be part of that presentation." A Nearpod collaboration utility allows the presenter to pose a question and have students post text and images in response. Prezi, the mainstay slide-sharing service, now offers the ability for multiple users to work on presentations simultaneously. "Instead of saying, 'Please wait, Mike, I'm almost done,' now [any user] can just take over," said Mullinix. Haiku Deck, an alternative presentation program has an education edition that keeps the slideshows within the class, allows for copyright-controllable image and video embedding and works across devices. The work of building a community has paid off, said Mullinix. Not only was there heightened student engagement, but she saw evidence of increased collaboration among forum members, shared insights and cross-inspiration. The result was just what one would expect from a real community: more sharing of "personal stories and journeys, successes, issues encountered and not feeling so alone."